It's a desperate plea from a family hoping someone has information on who killed their loved one in a road rage incident nearly two years ago. The family is now offering $25,000 for information leading to the killer's arrest. It's a desperate plea from a family hoping someone has information on who killed their loved one in a road rage incident nearly two years ago. The family is now offering $25,000 for information leading to the killer's arrest. A grieving mother was overtaken by emotion. It's her first time visiting the scene of where her son was murdered nearly two years ago. "They didn't even see a gun sticking out or anything like that. They just saw that car go flying off down that road," said Jason Sparks. Jason Sparks described the aftermath of the day his 36-year-old brother lost his life. Back in September of 2016 Chris Sparks was involved in a road rage incident on Ed Temple Boulevard and Buchanan Street in North Nashville. The argument escalated into gun fire, then the shooter took off in a silver Impala with tinted windows and rims. "You know you watch all the crime shows and they solve it before the second commercial break, and that is not what happened here," said Sparks. But the family is not giving up hope. In fact, they're doubling down. 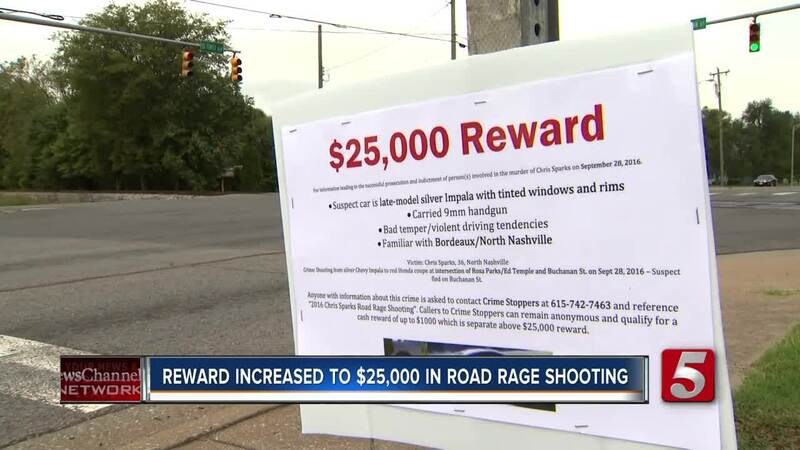 The family spent Saturday morning posting signs around North Nashville hoping someone can help lead police to this cold blooded killer. If you have any information on who may be responsible for this deadly crime, the family is asking you to call Crime Stoppers at 615-742-7463.